David Benton Jones writes to Woodrow Wilson regarding the Tariff Bill. The reform of the tariff and banking and currency are accomplished facts as far as Congress and the Executive are concerned. The next question which the papers indicate will be taken up is the matter of the trusts. There is one element in that situation which I have not seen developed. It is comparatively easy to bring about competitive conditions, and even competition, between corporations which are engaged in rendering service such as transportation, telephones, and telegraph. In these cases organizations are in existence, and to restore competition virtually means merely severing the connection between the combined parts. In producing industries, on the other hand, there is a condition which should be carefully considered, and which the courts will probably not be able to recognize or deal with. 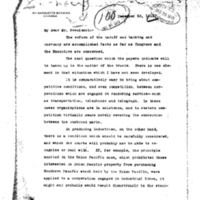 If, for example, the principle applied in the Union Pacific case, which prohibited those interested in Union Pacific property from purchasing Southern Pacific stock held by the Union Pacific, were applied to a corporation engaged in industrial lines, it might and probably would result disastrously to the stockholders of the consolidated corporation, and for this reason: in many cases the managers and those interested in the various parts which had been brought together to form the new coporation have died or have entirely disposed of their interest in the consolidated concern. To compel the consolidated concern to dispose of the plants acquired in the process of consolidation to those in no way interested would be to compel them to sell when there is no purchaser in sight and where no purchaser can be found except upon terms that would amount to virtual confiscation of the property. Competition in the field of industry is a growth and it cannot be restored except by the passing of time not of a few months, but sometimes of years. It took these industries nearly twenty years to restrain trade and to destroy competition. Competition in certain directions cannot be restored in much less time, and if the attempt is made to restore competition on the principle applied in the Union Pacific case it will involve convulsions and disaster of a very serious character, and even then it will require time to restore competition. I am not at all in sympathy with the clamor against the oil and tobacco cases. Competition will result even in these cases in time if the government is watchful and prepared to punish restraint of trade by methods or contracts inimical to competition. Stocks of these companies are becoming more and more distributed, through the settlement of estates and other changes, and there is, in my judgment, no danger whatever that competition will not be restored within the next few years. I need not tell you how completely opposed I am to the continued existence of trusts whose methods of business result in the control of prices. But I am convinced that for the courts or the Department of Justice to insist upon applying the Union Pacific principle to industrial corporations would result in great and widespread disaster. In more than one case competition actually exists where socalled trusts control over eighty per cent. of the product in their line of activity, and it is growing with astonishing rapidity and vigor. In other cases corporations are indulging in thoroughly objectionable practices in restraint of trade where they control in some cases less than thirty per cent. of the business. In such cases the evil must be reached either by punishment through the courts or by a process of education largely under the tutelage of the Department of Justice, or of some commission to be established whose bhusiness it is to keep a sharp lookout for such practices. If it is borne in mind that the government cannort go beyond establishing competitive conditions, and that time alone, coupled with human nature, can restore competition, then the transition between the period of control and the period of restored competition will be passed without losses or disasters of any kind. I am sending you this letter with great reluctance, as no one should break in upon your rest after the burdens of the last few months. My warrant in sending it is that I am sure you will be glad of any possible light that can be thrown upon a very complex situation. Jones, David B., “David B. Jones to Woodrow Wilson,” 1913 December 23, WWP18246, First Year Wilson Papers, Woodrow Wilson Presidential Library & Museum, Staunton, Virginia.